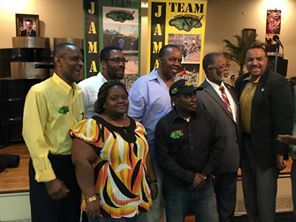 In its continuing quest to raise funds, Team Jamaica Bickle (TJB), held its second annual breakfast at the St Luke’s Episcopal Church Hall, 777, 222nd Street in Bronx, New York. The breakfast was yet another fundraising-community awareness event on TJB’s annual calendar in an effort to underwrite its huge hospitality undertaking at the annual Penn Relays, where it provides transportation, accommodation, coordination and assistance, meals, and other services to some 650 athletes and coaches. The first breakfast was held to a wide community acclaim in 2014, which led to it becoming an annual event. It presented some of the finest fare originating from ‘home country’ Jamaica which was a delight to the palate. Ackee and saltfish, Jamaica’s national dish, was the highlight, but the rest of the menu was not to be slighted. Liver and banana, callaloo, fried dumpling, porridge, plus a whole lot more satisfied the gastronomic island cravings. Food, paired with entertainment, is a sure winner, and to accomplish that feat, TJB called on ardent supporter and friend, the extraordinary one man-ensemble, Teddy Crawford.A vocalist and guitarist, Crawford’s repertoire was a perfect fit, as he delivered a rich, potpourri of folk songs and guitar solos, the kind of cultural engagement that audience love. Twenty-one years in, TJB continues to grow and diversify its offering. The organisation recently held its first event – a brunch in the DMV (District of Columbia, Maryland, and Virginia) area – amidst plans to establish a chapter in that region. Team Jamaica Bickle can be contacted at 718-523-2861 or emailteamjamaicabickle@gmail.com. Information may also be found atwww.teamjamaicabickle.org; facebook.com/teamjamaicabickle or on twitter,@teamjambickle. All the best in your continued efforts to serve our Athletes our Ambassadors! Encouraging donors to maximize their giving by utilizing their organization’s Matching Gift Program!